Magdeburger Joe.com: Bloomberg For President?! There have been a few articles in the paper speculating about whether or not Mike Bloomberg would run for President in 2012. There is even a web site called Run Mike Run. Despite the fawning coverage of Bloomberg's mayoralty, there is quite a different range of opinion on the street about Bloomberg as mayor and his prospects as President. Bloomberg has made public health a signature issue. First, there was comprehensive smoking bans. Then there were punitive taxes on cigarettes that have made New York cigarettes the most expensive in the nation. Then there was the ban on trans fats in restaurants that reeked of nanny state meddling in personal health choices. 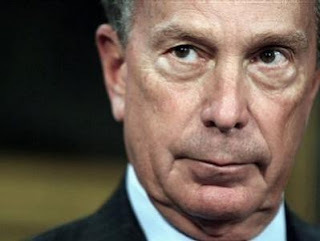 While Bloomberg has been mayor, the cost of traffic and sanitation tickets has skyrocketed. He comes across as a mayor for the wealthy who tries to maintain the fiction that New York is an ideal little village in which crime is enough under control that we can move on to making sure that every New Yorker finishes the veggies on his plate. Bloomberg got his foot in the door by running as a Republican. In most parts of the country, he comes across as a liberal Democrat. It is doubtful that party affiliation means anything to him at all. Bloomberg is a billionaire who made his fortune in the media. There is no law against having a heavy financial stake in the news media and running for higher office, but having such a stake in the news media has given Bloomberg an unfair advantage in controlling and influencing how he is portrayed. Bloomberg is not charismatic. He does not inspire impassioned support. He would be a good subject for a sci fi movie in which an evil villain puts Gotham City to sleep and then takes over. His management style is notoriously abrasive, yet it is airbrushed from the portrait of him as a business and political leader. He is thin skinned and bristles at criticism. He is extremely aloof in his management of the city. Unless he has the audacity to run for a fourth term, this should be Bloomberg's last term as mayor. It would be good for him to branch into creating a media outlet for public health that is as massive as his financial information empire. Millions of Americans want to safeguard their health of their own free will and not out of fear of some overreaching nanny state. Part of any strategy to defeat Bloomberg if he ever runs for President can and should involve the voices of ordinary New Yorkers who endured his mayoralty. It is doubtful that the sort of nanny state measures pushed by Bloomberg would be welcomed in the South and the Midwest. I would be eager to see Bloomberg News work on popularising public health. I would love to see him establish healthy fast food restaurant chains with low sodium burgers, low chloresterol and other offerings that are harmonised with good taste. The possibilities for Bloomberg to make a positive impact on American life are virtually endless. I would probably vote with my wallet for any Bloomberg attempt to build a business empire on the issue of public health.Running for President is another matter entirely. The very thought of Mike Bloomberg as President raises my blood pressure, more than any of the salt that he wants banned from New York City restaurants. Now if he cares about my health, why would Mayor Mike want to do that?